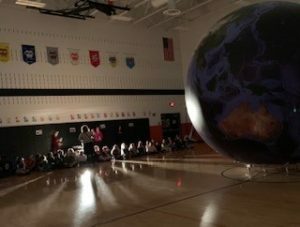 Orbit Earth Expo Visits Clearview Elementary! 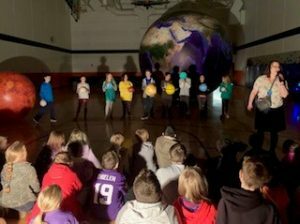 CLEAR LAKE, MINNESOTA – Orbit Earth Expo visited Clearview Elementary School yesterday. The wind was cold, but those Clearview Cougars gave Orb a warm welcome! 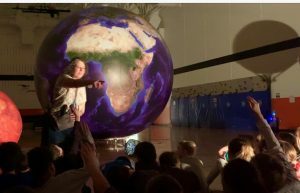 A group of students also had a field trip to the Planetarium at St. Cloud State! What a great day for science! We enjoyed spending a day in a Spanish immersion school – now Orb knows that the Spanish word for “rotate” is “rotar”! Rotamos la tierra y giramos la luna. ¡Los estudiantes fueron fantásticos! It was a special treat to spend time with Cougar Club and Kidstop after school! 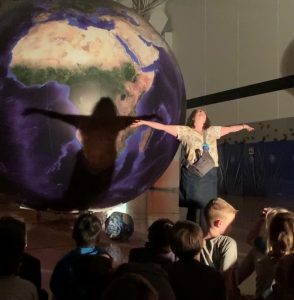 Orb loves curious students and clever questions! We were so disappointed that the weather didn’t cooperate for us to stay for Family Fun Night. We sure hope to try again next year! Thanks for a fantastic day, Clearview! We had a great time with you guys!